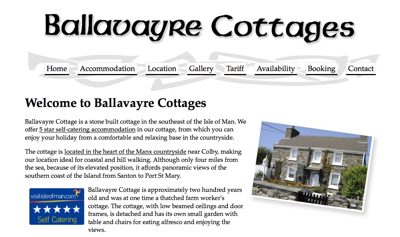 The new website for Ballavayre Cottages went live recently to give a new online presence to this 5 star self-catering accommodation in their 200 year old cottage in Colby, Isle of Man. The site, built on Drupal, allows the cottage owner to change content as and when they wish, and also to update their availability calendar to let visitors know when the cottages are available. To help visitors see at a glance where the cottages are located, and to give directions from the sea terminal and airport, we included a series of custom built maps, designed (with some very helpful tips from Steve Chilton) using OpenStreetMap data. It is always great to help promote the Isle of Man as a tourist destination, even in a small way, by giving accommodation providers a chance to promote their services to a wider market. Final maps look really good on website, and thanks for the credit. It is actually nice to see someone using the OSM data and customising the output to their particular needs rather than just using the OSM tiles per se. No worries, thanks for the hints and tips as I was working to create them! The maps do look really good, well done with them and the website. I like the use of strong borders on the roads and islands, might have to take some inspiration when I get round to making a local tourist map I want to do. Cheers Gregory. The strong borders do help add a bit of style to the map I think, and also help guide the visitor to the destination on the more detailed map. Looking forward to seeing your local tourist map!